April is prime family holiday time in my household. Winter has chilled us to the bone and the grey skies are making us desperate to get away. It helps that my children usually have a long break from school during April too because of the Easter holidays. So where should you be looking to take your family on holiday in April? With the Easter school holidays usually in April, it is a great time to get away for a long-haul break because of the extra time off. This means you can head to Asia where the weather is just perfect at this time. Thailand’s Andaman coast is enjoying temperatures around 30ºC at this time of year and there are plenty of great places to go – Phuket and Krabi and Ko Lanta. Expect wonderful beaches, spicy food and lashings of culture. Indonesia is about as exotic as it gets with plenty to appeal to families whether they are adventurous or prefer a beach. You have the culture and temples of Java, the jungles of Borneo, the volcanoes of Sumatra and the beaches of Bali and Lombok. With 17,000 islands to choose from, there really is something for everyone. Vietnam sounds impossible for families but in fact it is one of the most family-friendly destinations in South East Asia. Kids can try kayaking in Halong Bay, learning to cook Vietnamese food or getting a feel for traditional Vietnamese life. It’s always good to choose a specialist tour operator and Selective Asia knows everything you need to know about Vietnam. Another idea is to take a cruise at this time of year, combining Florida attractions and the Caribbean. Disney has its own cruise line and you can find deals with them and others through Iglu cruise. Costa Rica has become a huge family favourite thanks to stunning wildlife in its pristine rainforests. There is never really a true “dry” season – there is a reason it is so lush – but going in April means you miss the crowds and the worst of the rain. 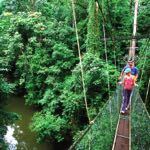 A typical family trip might include a stay in a lodge, rafting, wildlife spotting and the Arenal volcano. More ideas from Rainbow Tours. There are good April holiday options in Europe too. As spring gets under way, Portugal and southern Spain are starting to warm up nicely with places like the Algarve enjoying highs in the low 20s. A villa on the Algarve is a perfect April getaway – you get the luxury of your own pool and the flexibility to do things the way you want as a family. The coast has glorious beaches too. You may have been to the Algarve before but what you might not have tried is a stay in a pousada. These unusual and fascinating hotels are run by the state and include monasteries and fortified ancient towns. If you like the Portuguese style but want to try something a little different, why not head for the Azores or Madeira. Both are autonomous groups of islands that fly the Portuguese flag but offer a unique twist. The Azores, once believed to be the lost city of Atlantis, and Madeira are lush and green and burst into bloom as spring takes hold. Tenerife is always a good spot at this time of the year thanks to 13-hour long sunny days. One of the best family hotels there is the Ritz-Carlton Abama, overlooking the Atlantic and the island of La Gomera. 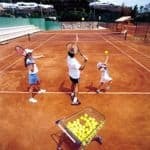 The hotel has what is claimed to be the largest kids club in Europe and has activities such as crafts, science, astronomy and an outdoor vegetable garden and also has sports academies for children wanting to learn tennis or golf. At the other end of the Med, Turkey is also enjoy long warm days in April. If Jet2Holidays’ fun new family holiday advert has got you in the mood for a break with them, try the family-friendly Turk Hotel in Olu Deniz. This colourful hotel is great value and is just a short distance from a Blue Flag beach and the famous blue lagoon. At the luxury end of the scale, Simpson Travel has some exclusive hotels and villas in lesser visited parts of Turkey, such as the Bozburun Peninsula, renowned for its bays and sheltered coves, olive groves and mountains. If you prefer the city to the beach, April is a great time to explore Istanbul. The city is jam-packed with interesting sights including the Hagia Sophia, the Basilica Cistern, the Blue Mosque and the Grand Bazaar. Stay in one of these hand-picked apartments or hotels in the city. 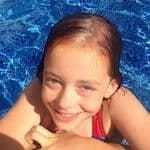 Our family has had some of its best ever holidays at Club Med properties. The combination of some of the world’s best family-friendly destinations, great food and top-notch activities for all the family is a real winner for us. If you prefer snow to sun, this is a great time to get some bargains at 22 ski resorts across France, Italy and Switzerland. 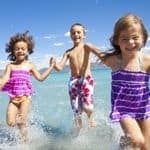 April can be a good time to get active with the family on holiday as the temperatures are not too hot and accommodation costs are much lower than in the summer. How about a family cycling holiday in Europe. Mallorca, Catalonia and France’s Loire Valley offer perfect pedalling at this time of year. Walking festivals pop up all over the UK as we enter spring, including Chepstow, Ulverston and Galashiels. Tie a trip together with the family to a cottage break in the north west, the Welsh borders or Scotland. You don’t have to spend two weeks away in Easter either – it is a great month for getting away for a short break and some of the southern European capitals are perfect at this time of the year, such as Rome, Seville and Palermo. For more inspiration on where to stay, try out iEscape’s Kids Collection of family-friendly properties in cities around Europe. Whatever you like doing as a family, there are some great options. Also check out where’s hot in April and see my ideas for Easter family holidays.